Rep. Ilhan Omar, who has been battling charges of anti-Semitism for weeks, apologized Monday for insinuating that U.S. support for Israel is fueled by money from a pro-Israel lobbying group — a comment that drew swift and unqualified condemnation from fellow Democrats, including House Speaker Nancy Pelosi. Her comments came after Pelosi and the entire House Democratic leadership issued a statement condemning her for tweeting Sunday night that support for Israel was “all about the Benjamins, baby,” a reference to hundred-dollar bills. The altercation was the latest example of Pelosi stepping in to try to keep her diverse and sometimes unruly caucus in line. She finagled her own election to the speakership, threw some subtle cold water on Rep. Alexandria Ocasio-Cortez’s ambitious “Green New Deal” and tamped down aggressive talk of impeaching President Donald Trump. In the coming days, she might again have to step in to pass an immigration and border security deal likely to anger the most liberal wing of the House. In this case, the leadership statement came as concern crescendoed over Omar’s Twitter comment linking money from the American Israel Political Affairs Committee to political support in Washington for Israel. That raised the anti-Semitic trope of Jewish money holding inordinate power over foreign policy. But it came on top of earlier flashpoints that pitted Omar against Israel’s fiercest supporters in Congress, Republican and Democrat. Last month, in an interview with Yahoo! 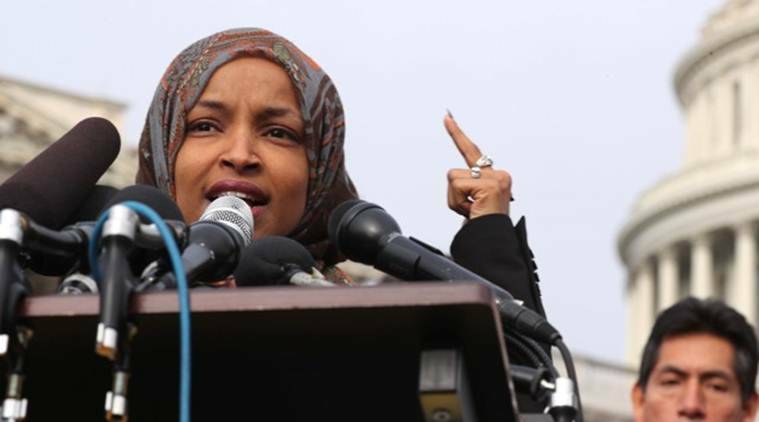 News, she said when politicians “still uphold” Israel “as a democracy in the Middle East, I almost chuckle.” In 2012, she tweeted, “Israel has hypnotized the world, may Allah awaken the people and help them see the evil doings of Israel.” Omar had been trying to mend fences over those comments when Sunday night’s tweet went viral. Omar did not back away from her contention that AIPAC has too much power in Washington. “At the same time, I reaffirm the problematic role of lobbyists in our politics, whether it be AIPAC, the NRA or the fossil fuel industry,” Omar wrote. “As Jewish Members of Congress, we are deeply alarmed by recent rhetoric from certain members within our Caucus, including just last night, that has disparaged us and called into question our loyalty to our nation. We urge you to join us in calling on each member of our Caucus to unite against anti-Semitism and hateful tropes and stereotypes,” they wrote. The Twitter exchanges began when Omar, one of the first two Muslim women elected to Congress, responded to a tweet by journalist Glenn Greenwald. Greenwald had accused Rep. Kevin McCarthy of California, the House Republican leader, of targeting Omar and another Democratic freshman, Rep. Rashida Tlaib of Michigan, who has also been sharply critical of Israel. But it did not end there. A Jewish journalist asked whom Omar was referring to when she suggested that money was driving U.S. Israel policy. “AIPAC!” she replied. AIPAC does not contribute to political campaigns, but its large-scale conferences and congressional trips to Israel have long drawn enthusiastic and bipartisan participation. They have also elicited charges that AIPAC has deliberately fed a one-sided view of the Israel-Palestinian conflict into U.S. politics. Tlaib, a Palestinian American, has been trying to organize her own congressional trip to the West Bank to give lawmakers the Palestinian side of the issue. And Palestinian rights groups largely stood by Omar and her criticism of the group. Republican leaders quickly demanded that Omar be removed from the House Foreign Affairs Committee, just as Rep. Steve King, R-Iowa, was stripped of his committee assignments after he made comments sympathetic to white supremacy. But what distinguished the events of Sunday and Monday from earlier controversies around Omar was the willingness of Democrats to join in. Omar had been trying to distance herself from a 2012 comment on Twitter in which she said Israel had been hypnotizing the world to look past its actions in Gaza. She expressed regret for trafficking in an anti-Semitic trope, which she said was unwitting. And she had reached out to Jewish Democrats to make amends. But her latest comments made some question the authenticity of her contrition. “In recent weeks, we have had conversations with multiple members of our Caucus who share our concerns about this rhetoric; we have also raised these concerns with Democratic leadership. We must speak out when any Member — Democrat or Republican — uses harmful tropes and stereotypes, levels accusations of dual loyalty, or makes reckless statements like those yesterday,” Luria and Gottheimer wrote. Published on Tue, 12 Feb 2019 01:59:26 GMT, © All rights reserved by the publisher.